This sums up my thoughts beautifully, at no point has this company paid less than it should, it paid exactly what the government permitted it to pay in taxes. If you want more taxes from companies and you want the companies to stop using loopholes in the tax code then close all of the loopholes and stop permitting new loopholes to be made. It might be time to fully review the tax code and find all the issues and loopholes that allow companies and people to avoid paying what they should. I am interested in how they avoided paying taxes that the governments are claiming they should be paying, but the issue is that the tax law let them avoid paying a large sum of money that the government believes they should be paying. What Google is trying to do is force a change in the law so that they must pay the proper amount and can not use loopholes. This will have the effect of stopping all companies from using the loopholes not just Google. This will increase the tax flow from all companies and allow the government to provide the services that society needs to operate. This entry was posted in Google, Thoughts and tagged democracy, Eric Schmidt, Google, Governments, Law, tax, Thoughts on May 27, 2013 by nightred. The gadget days have not ended, we do not carry around pocket organizers, e-book readers, camcorders, digital cameras, handheld gaming systems, and dumb cell phones. All of this is now part of one device our Datapads, you could have a better camera but you do not need to have it always. So what is the new gadgets will the geeks start to collect? I mean the people that are always looking for the next gadget. The gadgets that they will collect will not be cool or useful or popular, but they will be innovative and forward thinking. This is the tech that we all will use in the next 10 years after is has been refined and merged into one device that we will all use. This is my short list of tech that I can not wait to get my mitts on and test what they can do for me. This is a ground breaking immersion virtual reality head mounted display. What this does is shows a separate view to each eye using a head mounted unit that is very light. The device will also track your the movement of your head changing the view point in the virtual world. This will be one of the most immersive experiences that you will have in gaming for some time. The Muse is a portable head mounted brainwave monitor. You will be able to see your brainwaves in real time on your Datapad or your computer. This will have options to control games, visualise your mental state, and help in reducing stress. The best example of this is the Apple iWatch, A wrist mounted display that will show incoming calls and messages. The idea has been around in the past but the technology was never up to the idea. We might be able to make it work now. I hope before it become relevant. This is a very broad field but soon we will have temporary tattoos and implantable rice grain sized devices that will monitor your biometrics. This is very interesting feedback, you could show your doctor your pulse rate and blood pressure over a week period. You can tell when you are dehydrated, and so much more. The important part is that you are an organic machine and you need to keep your self in proper running order for peak efficiency. The next set of gadgets are going to be very interesting, I will keep you posted. This entry was posted in Gadgets and tagged Biometric Monitoring, Biometrics, Future of Computers, gadgets, Glass, Google, iWatch, Oculus Rift, The Muse, Thoughts on May 13, 2013 by nightred. The best new feature that Google has added recently has to be your monthly account activity report. This report covers a lot of detail about what you have done in the past month. This can help you see what is recorded if you are paranoid, but it can also help you see if someone is accessing your account without you knowing. You can manage your Google account activity report here if you do not have this already setup. I can not express how much I like this feature. The first thing you see is your account activity showing what locations you have accessed your account from, password changes, email addresses added, connected apps, Everything you need to know to keep secure. If you are a major user of YouTube you can see a nice overview showing how many videos you have seen and how your videos are doing at a glance. All of this data is only an at a glance overview of your account, you can go to the account dashboard, view your YouTube analytics, your search history, or any of the other locations your data is recorded. The part that makes this very nice is that you can receive a monthly reminder to look at this report and get a quick overview of your accounts activities to help you better understand your own usage. Very nice feature that shows how Google wants to keep you in control of your data. Keep up the good work Google. This entry was posted in Google and tagged Account, Activity, Google, Thoughts, YouTube on May 9, 2013 by nightred. I have an idea for a new service, a simple but clean service. This will be a Question system, you ask a question that has a multiple choice answer and everyone can respond. This work on the idea that with a large sample size (thousands) you are likely to get the correct answer for the question. The idea here is that anyone or thing could ask questions and get a feed back from a huge sample size. Simple, fast, and you could get some interesting data. This entry was posted in Thoughts and tagged Thoughts on April 1, 2013 by nightred. I have made a presentation on why I belive Google will Keep Google Keep. This is my thoughts on the Technology Singularity, and what the next steps of computing will be. This entry was posted in Google, Thoughts and tagged Future of Computers, Google, Google Keep, Google Reader, Thoughts on March 28, 2013 by nightred. What would the world look like after file sharing has been accepted as common place and is not punished by governing bodies? Currently most movies would be produced by a large studio that provides backing for the film, this has the benefit of using the studios resources and locations to film. You have access to all the personnel and support to make a big feature film. With the increase of downloading and sharing movies with out a purchase the movie studios are not able to recover the costs of movies that are produced. This is a major issue because with out the income from movies that have been produced no new films can be made, and the funding for the film has been lost. The largest change to all of this has been services like Kickstart. These services provide a major change to how we start a project, you are not paying for the product after it has been developed, produced, and gone to market. In this new system we are presented with ideas that people wish to develop in to a product, book, film, or even a game just to name a few of the mediums supported. As a consumer you get the option to support a project before it is produced showing your interest, and showing market viability. The change is very simple, we would go from a culture that is told what we would like to a culture that says we like this please make it. We have always seen a product or idea that would have been great but it was never produced due to risk or lack of backing. Now we can show the support and willingness to purchase the item before it has even been produced. Think of what we could have with out marketing telling us what we want. This entry was posted in Thoughts and tagged Better World, Thoughts on February 11, 2013 by nightred. 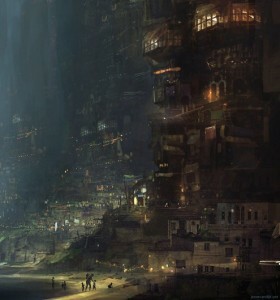 From van Dijk’s site: Life at the bottom of the city. Why do you work? Do you work for the excitement, the challenge, or the fun of what you do? Do you feel good about what you do at the end of the day? Would you take a pay cut and be just as happy? Or do you work so that you have currency? Do you work to feed your self and your families? Could you replace your job with any other job as long as you get more currency? I wonder if socialist ideas do not fail because they are flawed but because society is flawed. Why is the idea of a guaranteed standard of living a bad thing? Why would you stop working if you had a guaranteed standard? Is it the fact that your work basically pushes you to work harder, does not care about your stress levels, and just want a more productive you? 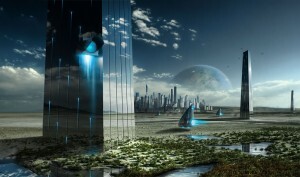 Futuristic city concept art by Andrea, Italy. I think you should work because you like what you do and you feel productive. I think we should all strive to make everyone feel better and live better. The world should not be a few rich standing on the backs of the lesser. No I do not think you should give all your currency to charity and you should not have to sponsor children in a third world. Think about all the people that want to help why can we not just work at making everyone have a universal standard of living regardless of location on earth, race, or age. Remember we are one race, we are one people, we all should all be equal, regardless of your personal view of how much better you are. You are not better you are not worse you are part of us. This entry was posted in Thoughts and tagged Better World, Thoughts on September 18, 2012 by nightred.